I bought your book a few years back & followed your diet to the best of my ability and it literally healed my body. My periods came back full force in a week and I slowly but surely lost weight. My energy levels and mood improved dramatically. Not much has happened in the way of reducing my facial hair but 4 out of 5 is not bad... and it hasn't become any worse. I read every one of the newsletters as they are informative and give me hope when I feel down about having PCOS. I am still following your book for the most part- I would say around 80% of my meals would fit the guidelines of your book. Some high quality organic low GI carbs and goat's milk have been re-introduced into my diet in strict moderation and don't seem to be upsetting things in any way. I have not attempted to get pregnant at any stage as I was doing this would have a strong chance of success (I can just feel myself ovulating each month). However I am facing a serious ethical crisis that I am struggling with and has brought me to tears from time to time. It is of course about my consumption of eggs and meat. I have always felt strongly about animal welfare from the first time I attempted vegetarianism as a 15 year old. Although I have been ordering free range certified organic meat from one of the most reputable sources around (I'm based in Victoria, Australia) I know the animals must eventually be slaughtered and the methods used are not as 'humane' as some people would have the public believe- an example being the electric stunning used prior to throat cutting does not always work and in some cases animals remain conscious throughout the skinning process until they are literally chainsawed up! As for the egg industry, I'm not sure about the US but in this country the terms 'free range' and 'free to roam' have been misleading the public as the egg producers try to stretch the meanings of our rules and standards. All egg laying hens are killed when they can no longer produce eggs at a certain rate- free range organic or not. This is of course years before their natural death. I watched the award winning documentary Earthlings 3 days ago and have not been able to bring myself to eat any meat or eggs or to place my regular order with my usual supplier. I'm not sure if I ever will again. I seriously want to become vegan as it is the only compassionate choice for animals. Naturally I am worried about the effect of this dietary change on my PCOS management, which has been going well. Are you able to make any recommendations for me. I have been reading up but so far have found no studies on vegan or vegetarian diets in relation to PCOS. I have found articles on it with regard to diabetes though and there was nothing to put me off there. From what I have read so far B-12, Zinc and Vitamin D seem to be the danger zones for vegans/vegetarians. I just remember the chapter in the book saying it wasn't a good idea but there has to be another way. I might consider getting some chickens in my backyard or something but I can't hunt, farm or slaughter my own animals. I would appreciate any advice you could offer on possible PCOS management for vegans or research that is/has been attempted. Editor's comments: Hi Amy, you have touched a raw nerve that many people are concerned about. The reason the "modern world" has so many chronic diseases such as diabetes and heart disease, and the reason why women with PCOS suffer so much is because of our mass-produced, factory-farm produced food and beverages. The food industry will produce food in the cheapest and most profitable way it can. There is almost no consideration for your health or the well-being of animals that are converted into food. Most people have no idea of the crap and poisons and worthless calories they consume every day. Equally important, we have broken our connection with nature. The younger people among us barely know where milk, eggs or hamburger come from. Until the last century or so, most humans raised their own food or acquired it locally. Today, food is assembled from all over the world and presented to you in your local supermarket. We have no connection or understanding of the animals that produced the food, where and how they were raised and cared for, the land where the food was produced, or of the people who worked to create the food. I firmly believe that any women who has PCOS will get better if she can reconnect with her natural world. That includes walking in the local park, going to the beach, visiting nearby mountains, and just exploring different places. And what about food? Let me tell you a story. A long time ago, I had a long conversation with Arthur Maslow, MD. He was very successful in treating patients with multiple sclerosis. How did he do that? He instructed his patients to start a garden! Image that! There is something healing about growing your own food. We all know that the freshest, healthiest food is grown in your own yard. In addition, gardening exposed Dr. Maslow's patients to the sun, which produced more vitamin D in the body. Vitamin D is crucial for controlling MS. By the way, vitamin D is also crucial for controlling polycystic ovary syndrome and overcoming infertility. If you can, I recommend you start growing your own vegetables. If you can, plant nut or fruit trees. If you have a small yard, maybe you can grow some vegetables in pots. Your idea of raising chickens is a good one. Many people, even in urban areas, have chickens. They are an endless supply of high-quality eggs. Possibly, you could also raise rabbits. The only problem is that you will bond with these creatures and thus will be unwilling to slaughter and eat them. I might suggest that you have someone else slaughter them and when you eat them, consider that you took excellent care of them and cared for them, and in return, they provide you with nutrition for your continued existence. So why not become a vegan and just eat plant material? Wouldn't that be a wonderful way to avoid all the problems and feelings about eating animals? 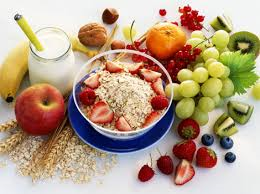 The problem is that plant material does not provide you with the full range of nutrition you need. A primary issue is protein adequacy. Unfortunately, plant proteins are not totally identical to animal proteins. Eating beans and rice is not quite the same thing as eating an egg. Secondly, lots of women with PCOS who are vegetarians end up eating a diet that is mostly carbohydrates, in one form or another. A carbohydrate-heavy diet is a primary driver and cause of PCOS symptoms. You end up eating too much carbohydrate because you have to eat something. If you remove animal protein, what are you going to eat? Rice? Corn? Soy? Quinoa? Wheat? Beans? All of these foods are high in carbs compared to animal protein. If you eat refined, manufactured products made from these foods, you are exposed to "refined" carbs, which are the worst kind. Third, some plant protein sources are questionable, especially soy. Most of the soy we consume is genetically modified (GMO). I consider GMO soy to be unsuitable for human consumption, based on the research I've seen. Some of this information is available elsewhere on this site. Fourth, vegetarians and vegans are going to have reduced vitamin B12 and omega-3 fatty acid levels. This increases the risk of blood clots and atherosclerosis, according to a research from Zhejiang University in China. These deficiencies also have adverse effects on your future child during your pregnancy. Many women with polycystic ovarian syndrome are taking metformin. Metformin induces a vitamin B12 deficiency, which increases risk. Fifth, it's not clear whether or not a vegetarian diet helps women to ovulate. One small study suggested that most of the non-PCOS women who went on a vegetarian diet stopped ovulating. So…finally, is there an "ideal" protein that is not animal-based? Actually, insects are an ideal source of protein and other essential nutrients. It's too bad that those of us in "advanced countries" will not eat this excellent food. You could raise insects and blend them into your other foods. Of course, I don't expect anyone to do that, simply because it is not appealing. It's so much more convenient to go to the supermarket and purchase chicken laden with antibiotics and other unhealthy substances. Other than insects, eggs are an excellent source of balanced protein. Other possibilities of non-animal protein are protein powders such as whey, rice or pea protein. Are you willing to eat fish? Small fish like sardines are an outstanding source of protein and essential fatty acids. But please note that some new research is indicating that fish are not dumb, unfeeling creatures. By the way, I have not seen any medical studies to indicate eating a strictly vegetarian or vegan diet is effective for treating PCOS. However, it is well proven that eating more vegetables IS very helpful. 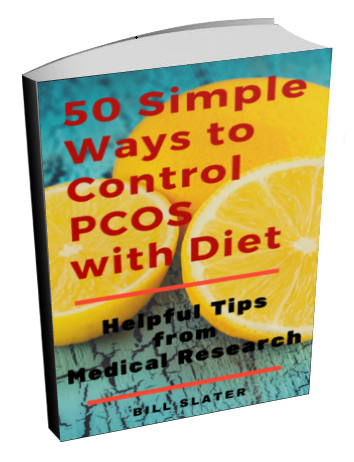 Many doctors take a simplified "cookbook" approach to treating polycystic ovary syndrome. That's just the way it is. MDs are trained to prescribe "this" pharmaceutical for "that" disease. They are disease managers, not health rebuilders. If anyone truly wants to be healthier, they have to look to themselves. 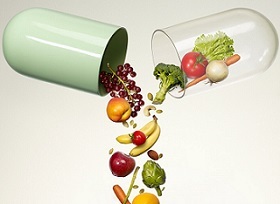 Pharmaceuticals help to manage disease symptoms but are not capable of making anyone a healthier person. 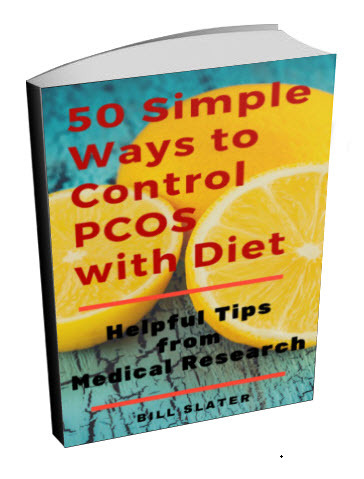 Metformin is effective for reducing the symptoms of PCOS. For this reason, it is widely prescribed. I think it can be quite helpful in some cases. However, any pharmaceutical drug I can think of has some side effects. It's interesting to note that non-prescription substances might be as effective as metformin, such as berberine extract or NAC, just to name two examples. And no side effects! You may find a book I am currently reading called The Secret Life of Plants by Tompkins & Bird profoundly interesting. As a mother of two ages 3 and 5 let me oversimplify my conclusion with a Lion King analogy; There exists a circle of life. Where would you say mankind sits on this circle? It seems to me that mankind should humanely sit atop that circle. I have always preferred a vegetarian diet but never professed myself to be a vegetarian. I was nicknamed "Rabbit" as a child. This improvement (and examples like your success) is evidence that my preference combined a little bit of good intention was not in balance with my actual needs. My personal beliefs did not prohibit me because I believe all things were put in subjection under mankind. Therefore, I attempt to never abuse this responsibility and abstain from the common inhumane, greedy, and wasteful practices. We welcome thoughtful comments from anyone. 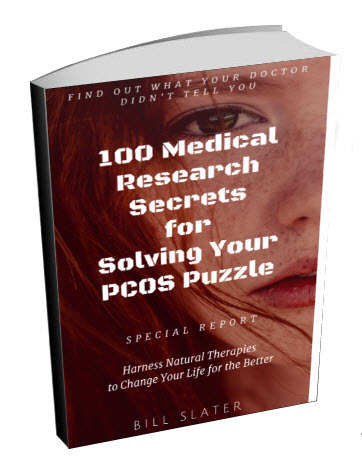 We have to work together to solve the PCOS puzzle. I don't know it all. Neither do you. Neither does your doctor. I'm grateful for your comments about vitamin A. It was very interesting and something for anyone to think about. Of course, it's wise to consult with an experienced, licensed naturopathic doctor or some other qualified health professional who understands chronic disorders and supplemental nutrition. I'm a big fan of lab testing because it can provide useful data to help make a more informed decision about treatment. Feel free to remove my comment if you feel it could result in a negative outcome. I did not know about danger of excess androgen production in relation to the screwy way retinoids get metabolized by PCOS sufferers. I responded favorably to the carotinoids and was able to induce ovulation and then conceive with 2 months of concentrated drops (I believe I was prescribed 25,000 iu's per day). I think large doses of any nutritional supplement should definitely be monitored by a knowledgable professional to do the necessary tests and monitor hormones. Hypervitaminosis with fat soluble vitamins can be really bad juju, so please no-one run out and buy megadoses of Vitamin A, this should be doctor or naturopath directed, with continued testing and monitoring. If trying to conceive, no more than 10,000 iu's per day is recommended of retinol because it can result in birth defects when taken in excess (although the synthetic form has been linked much more strongly to this than natural forms). For those who are weak converters, do you know if there is a different impact from vitamin A on androgen production from fermented cod liver oil, as opposed to your basic bottle of just pressed oil? Or from whole food sources where there might be co-factors to mitigate the damage? And of course I would be curious to know which form was used in the androgen studies, whether it was synthetic or organic in nature. Hi everyone, thanks for your excellent commentary! I totally agree that carotenoids are essential for ovarian health, so large doses of mixed carotenoids (NOT just beta-carotene) may be advisable. And I'll admit that some people may not efficiently convert beta carotene into vitamin A. But regarding taking large amounts of vitamin A for PCOS and ovarian health...well, I'm not so sure. Granted that adequate vitamin A is necessary for support growth of ovarian tissue and normal development of an embryo. We also need to have some kind of "optimal" ratio between vitamin A and vitamin D. An imbalance between the two can lead to problems. I don't know what that optimal ratio is. I'm also not sure what the "optimal" dosage of vitamin A should be. I think it really depends on the individual. However, from what I've seen, it is far more likely that women with PCOS will be deficient in vitamin D rather than vitamin A. I don't advocate taking supplemental vitamin A if you are low in vitamin D (as shown in a vitamin D blood test). If low in vitamin D, taking a 20 minute sunbath every day is not going to solve that problem. Supplemental D3 will most likely be required. An additional issue is that women with PCOS seem to have a vitamin A system that differs from "normal" women. In other words, vitamin A metabolism is dysfunctional. So if a woman with PCOS takes vitamin A, the outcome may be different from a non-PCOS woman. For example, Pennsylvania State Hershey College of Medicine reported in 2005 that, in a lab experiment, vitamin A had the effect of increasing androgen (male hormone) production in ovarian cells. An increase in androgen production is not something we are looking for. Rather, it is something to be avoided. ...One last notable thing. Roughly 50% of the population cannot convert beta carotene into retinol, and do require an animal based version. My naturopath is very concerned about vitamin A levels in her PCOS patients, and will start with a trial of large doses of beta carotene to see if it helps, but switches to an animal source (like Cod Liver Oil) if that doesn't work, it takes a lot of vitamin A to maintain ovary health. If you are able to convert beta carotene (and have access to a lot of sun for vitamin D to balance it) you might be able to do quite well without animal products, but if you aren't able to convert it, and feel ethically obliged to avoid animal products you are essentially choosing between you ovaries and your morals. ...I grew up telling my classmates that their hamburgers were going to kill them, and would describe the horrors of factory farmed meats to them to try and put them off of their meals, but it was neither honest nor kind, painting such a black and white picture was disingenuous. I suffered from anemia, every dentist visit resulted in new cavities, I had anxiety attacks, and didn't have much energy for competition in the classroom or in sports, but I thought all of that was normal for me simply because I lacked perspective of any other reality. When I finally let myself "indulge" in red meat as an exchange student because I gave into hunger and had to eat what was given to me, I felt a vitality wash over me like I had never known. I took all the supplements you are supposed to take if you don't eat meat, but supplements aren't whole foods, and if you aren't descended from grain eaters the damage to the gut lining from the phytates and saponins can make absorption of supplemental nutrients even more difficult. I took b-12 and iron, but I believe it was the meat specific and overlooked things like carnitine and carnosine along with the heme iron from that meat that made the difference in my health as I have slowly allowed more and more into my diet I have continued to grow stronger and healthier over the last decade. Buying happy pastured animals, with humane on-site slaughtering is how I am fighting back against the factory farming that I think we would both agree is equal parts cruel and destructive. Restoration of pasture, and supporting these farms also helps to sequester CO2 into the soil at far greater levels than organic animal-free farming. Animal poop and bones keep the soil alive, so we can have beautiful kale and blueberries even if we are able to choose not to eat the animals doing the soil revitalization for us, I believe our interdependence is a mutually beneficial operation. ...One's heritage and ethnicity play a role in what works/doesn't work in the diet (although Weston A. Price was super disappointed that he was never able to locate the happy healthy vegan tribe he set out to find to support his theories, and later became a proponent of animal products in the diet for optimal dental health). If you feel super awesome, and pregnancies in your family were easy on a vegan diet I suspect that if you got your ApoE status checked you would have either ApoE 2/2 or 2/3 alleles, as many successful vegans do, there was significant selective pressure for those alleles to adapt to a grain based diet, and most carriers of those alleles descended within the last 10,000 years or so from the the Middle East, Northern Africa and Southern Asia. Others with ApoE 3/3, 4/3, or 4/4 are more likely descended from pastoralists, hunters, fishers, and foragers. The availability of sunlight also influenced these alleles, those with 4/3 and 4/4 being from low light areas (at least part of the year) covered with jungle canopy or closer to the poles, and these same people needed to be able to synthesize vitamin d from the diet(animals and mushrooms)in ways the other alleles never developed because they didn't need to. If you live somewhere sunny, and your ancestors came from a grain-tolerant area, you might do very well with a vegan diet, if your ancestors are from Northern Europe, Northern Asia, or the rainforest, I think it would be much more difficult to thrive without fat soluble vitamins and complete animal specific amino acids (not everyone's gut is good at putting fractional amino acids together through food combining). Just adding more plant protein can seem like a good solution and can be if tolerated, but most humans have colons that are too short to extract all of the needed nutrients from plants (gorillas however are fantabulous at this) and end up with quite a lot of bloating if they titrate up their plant food consumption beyond 1-2 servings per meal to get more plant protein. Our unique humongous brains, long small intestine and short colon is unique among primates, and indicates as we branched away from other primates some sort of change towards both cooked food and animal nutrients, the ratios of course varied based on local selective pressure. I was born and raised a vegan. I come from a family of parents and grandparents etc. who were also born and raised vegan. Pregnancy concerns, the development of the child and the vegan impact on the development of a child inside its mother were never negatively impacted as a result of living a vegan lifestyle. I think it is absolutely ridiculous for individuals to say that during pregnancy you need to take in animal/egg protien to ensure the best development of the child. I am, my family and many other people I know are living proof that this is not true. People really need to be educated, do their research and not follow the advice and heresay of everything they here. In regards, to the vitamin deficiency, yes this is true, but there are ways to suppliment this. Instead of quickly turning to animal protien to make up for these deficiences, boost your vegetables and other sources of protien intakes; take vitamin suppliments (I have been). I was also diagnosed with PCOS and it was shocking because there is not family history of any types of these problems; I am the only one. The major thing I have had to adjust is my fitness; I have had to become more active to ensure that my body weight does not increase. While I search for other natural and vegan friendly alternatives; I just want to say that people shouldn't listen to everything they hear. Be patient, do your research and don't cave into the pressure of eating animals if you don't want to, because you certainly don't need to! 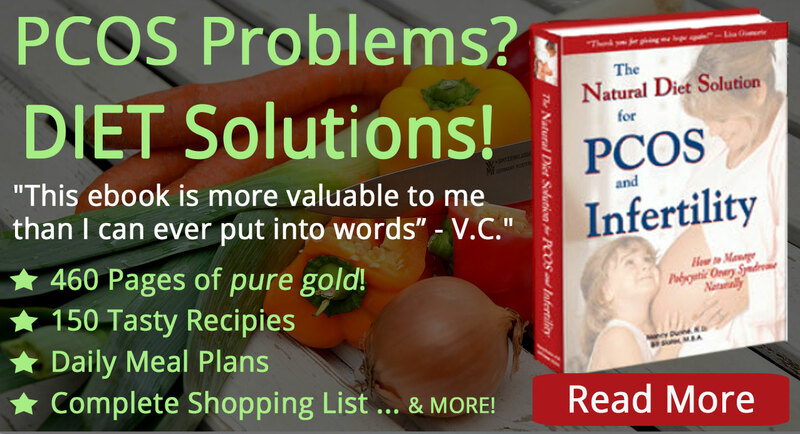 I can totally relate to Amy and how I felt when I read the PCO's Natural Solution Diet book. I was born vegetarian, and turned vegan 4 years ago and will not give it up for any reason. Maybe she should consider a Raw Vegan diet and consider a combined therapy with Acupuncture or Chinese Herbal Medicine. There is also another diet that I found that is very similar to the one promoted by this web site but by Dr. Eric Berg. I found Dr. Eric Berg's diet is more 'vegan' friendly and focuses on something similar in terms of it being a "hormone" balancing diet. From his diet, I learned that strengthening the liver and kidneys could be a key solution to PCOS and one can do that by choosing the right kind of foods and protein sources (even veg ones) and using natural therapies. I am currently on a low GL diet, no white sugar (I use coconut sugar or sucanut), no wheat products, very little soy, and certain beans. Basically, my goal is to eat 50% raw foods a day as much as I can. Lots of greens, green smoothies with kale, green drink with organic green powder, fruit. I combine this with chinese herbal medicine that I got from an reputable, Chinese trained Acupuncturist to strengthen my liver and kidneys. Going vegan is the future and I believe that the plant-based world can offer a vast range of nutritional health that is better than what flesh eating can offer. Like Amy says, grain fed, organic, free-range is not regulated industry so what ever the animal eats, we end up eating. All the best Amy, and thank you for sticking with the vegan way to better your health with compassion to you and your fellow beings. After years of frustration on medication I healed my symptoms of PCOS by becoming a pesci-vegan (I eat fish sometimes, but no other animal products). I wouldn't change it - my health is well above average and my lifestyle is in line with my views on ethics and sustainability. In addition to the nutrition concerns of going vegan such as PCOS and inadequate nutrition, and poor teeth, you want to look at not just the immediate animals you are eating- but also what effect that you can have on the welfare of all animals used for foods. By becoming vegan, you will save the animals that you have not eaten, but this has little effect on the production and care of animals. Choosing the very best available sources of meats/dairy that are the kindest to animals that you can find pushes the market to where more people will produce this kind of animal. More and more people demanding better care of animals for their meat, and choosing this to purchase is essentially voting and changing the market with your dollars. Think of it that way. I was raised vegetarian, and we worked hard to get "the right" ratios of everything, but it is an inherently high carb, high phytate (grain), high lectin (legumes), excessive omega-6 (seed oil) diet, all of which contribute to inflammation. I'm pretty sure 20 years of that is why I have PCOS/metabolic syndrome now. It has been a hard truth to come by, and many tears were shed along the way, but when it came right down to it I realized that I needed to have at least as much compassion for myself as I do for other beings. If I wouldn't blame a cat for not thriving on an evolutionarily inappropriate diet, then why was I so mad at myself for not thriving on foods that weren't right for me? I would highly recommend the book "The Vegetarian Myth" by Lierre Kieth. She was vegan for many many years until her body broke down and she had to make some tough decisions. There is essentially "no free lunch" when it comes to eating, more animals die for harvested crops than for the slaughter. If you do feel like you need to refrain from animal products to have peace in your heart I would suggest Denise Minger's article http://rawfoodsos.com/for-vegans/ for getting the right supplements. She also suggests mollusks as being an acceptable source of animal protein because they don't have central nervous systems. I look to my taking of meat as a spiritual experience these days, I have finally accepted that I am an omnivore, and there is nothing inherently immoral to me about eating prey animals anymore, they evolved to be eaten, just as I evolved to eat them. As humans we have the unique perspective of being able to be compassionate predators, and can make sure our food only has one bad moment. I try to take from as few animals as possible, and that means large herbivores. I find more peace in taking the life of one grassfed cow (who with the help of the sun turned grasses that are inedible to me into optimal nutrition while nourishing and replenishing the soil with its outputs, maintaining the grassland ecosystem therefore helping to balance the earth's temperature...perfect circle of life). I can thank that cow personally and express my gratitude towards it, and feed my family for the entire year with one animal. I find that preferable to the random senseless decapitation of rabbits by combine machines harvesting grain crops, poisoning rodents to keep our stored crops edible, and displacing grazing ruminants from their rightful land, the prairie, to strip the soil for agriculture. The fertile crescent was where agriculture started, it is now desert. Stripping the topsoil of the earth for non-meat foodstuffs isn't going to help any of us man or beast in the long-term. My update- for anyone who is interested. My partner & I have been on a vegan diet since watching the doco I mentioned in my first post. I decided to do this until I educated myself sufficietly to be in a position to decide what was best. I stumbled upon what this woman had to say about giving up a vegan diet after intense medical testing and advice from a doctor who specialised in human nutrition. It does make me a little concerned for our future health. I will def be getting some eggs today from my local small scale integrated agricultural markey. I don't care what they cost. I'm back to thinking about insects. 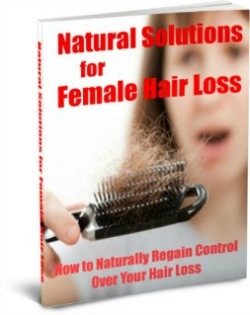 Maybe the PCOS who wrote the book are right afterall. What I found sooo amazing in the post was all the self-proclaimed vegans confessing to secretly eating eggs occasionally and meat just to keep themselves healthy. This blew my mind. Obviously these health issues affect each individual differently and some people definitely suffer more on a vegan diet. Also they can take a long time to manifest themselves and come on slowly, so people may not think it is their diets causing extreme fatigue, depression and inability to focus mentally etc. I think a primarily plant based diet is the way to go but upon further research we can introduce small servings of sutainable fish like sardines, mackerel (wild caught not farmed), the occasional piece of wild caught salmon, some Australian pest animals such as wild boar/goat/deer (animals who thrive here at the cost of the natural ecosystem). Perhaps we can eat a small serving of kangaroo every once in a while, being the lesser of many evils. At the very least it has led a natural wild life and has not been farmed and confined. Also there are facilties set up to help our native animals, so some of them are saved to compensate for those we eat. They are not 'owned' and their genetic pedigrees copyrighted by large corporations like pigs. Diary will remain a no go zone for me as I think it is food my body will do well without/I do not need and in this case I can attempt to offset and substantially reduce my dependence on animals and any cruelty I am an accomplice in. If we are to consume meat it must be done as ethically as possible and in strict moderation. The essay under available under the web address is of a high calibre and is well worth consideration. Thanks very much for all the information, Amy. I will try to contact those doctors. The Ultrasound cost seems quite affordable once I get a medicare for myself. I am glad that those doctors are "real" doctors who can understand and show interest in curing their patients. I need to consult such doctors as I got really tired wasting my time, energy and money on doctors that were insensitive to my conditions. Good luck with your health and I hope you get sincere answers from those farms. As you can imagine over the last few days I have been foraging for info and talking about this with my close friends. Editor, thankyou for your informative and though provoking post. A friend of mine is convinced that someday there will be some terrible antibiotic resistant disease outbreak from a factory farm that will wipe out a large percentage of all mammals on the planet. If humans survive insects might be all there is to eat! Its a bit out there but not out of the realm of possibility given the crazy things some of us are doing. Some Indigenous and First Nation cultures ate insects. I believe you can have a bug softshell tortilla in some parts of Mexico. On finding a good doctor that will be sensitive to PCOS and all it entails, I have been going to The Doctors of Northcote and usually see Dr Borthwyck or Dr Thorn (both female). They are still 'doctors' (if you know what I mean) but will acknowledge that they don't know everything, there is room for alternatives and will stress good diet and exercise as the cornerstone for prevention of any illness. If you need to have an ultasound or see an endocrynologist to check out your ovaries they will refer you. Doctors of Northcote bulk bill, so if you have a medicare card it will cost you about $20-30. They are more expensive on a Sat though. I think most of us have gone through the Dr drama, so I now what you mean about bouncing from Dr to Dr. If you go to these Drs they might try to put you on Metformin. I said no & that more pills were not the answer. but I have few questions and would like to visit. I have asked Organic Direct http://www.organicdirect.com.au/ , the company I was getting meat from, some pretty serious questions about de-beaking, stocking densities, the slaughter of hens when their laying ability decreases, the castration & teeth clipping of tiny piglets without anaesthetic and details of slaughter- is it done on the farms or at a commercial slaughterhouse & what methods are used. Also the slaughter of sows when they slow down on giving birth to litters and if they actually get time out from giving birth. If they answer my questions seriously and seem truthful, I will request to visit the farms and even the slaughterhouse if I have to. I must thank you, Amy. After my first post here, I read about cruelty in milk production and I decided to go vegan starting today. As a start, I gave all my milk products to my friend. Taking baby steps and hoping to stay strong. Best wishes for your health and please let me know if you are aware of any good, understanding doctors in Victoria. Thanks again for triggering the spark in me to take this decision. I feel good to see this post. I also live in Victoria, Melbourne, Australia. I have PCOS and am a lacto-vegetarian. I've been a lacto-vegetarian since my birth due to religious reasons, but I began to appreciate it a lot more growing up as an adult. Now, more than being a religious reason, it has become one of my life principles that I will follow throughout my life. Strictly speaking, I shouldn't be consuming any milk products as well. Although it is acceptable in my religion, consuming milk is somewhat against my life principles. This is mainly because of the process involved in extracting milk from the cows and how the young baby calves are denied their own mother's milk. In olden days, cows were milked manually and us human beings had more compassion. We were kind enough to feed the calves first before sucking out milk from the cows. This doesn't happen anymore and I feel ashamed of nourishing myself at the cost of other creatures' pain. I am planning to go Vegan sometime in the future. I have nothing against non-vegetarians. I respect their view. About PCOS, I jumped from one doctor to another in Victoria. Well, I had to go through a mis-diagnosis that gave me a clean chit and my doctor began to blame me that it was all in my "head". That was emotionally painful. I then went to the Royal Women's hospital once, my PCOS was confirmed with more than 15 to 20 cysts on each ovary, but it is too hard to get an appointment. 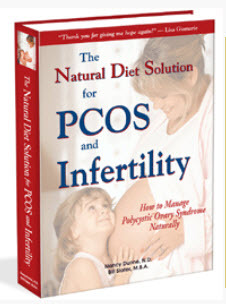 Amy, do you know any good doctors around this place who understands PCOS well and who can treat at a reasonable fee? My GPs also suspect that I might be having endo, but I've been living through it.